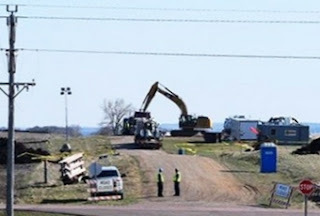 Cindy Myers photo of Keystone 1 leak in S. Dakota. Donald Trump has given TransCanada a permit denied it by President Obama for its Keystone XL pipeline, an extension to Keystone 1, which leaked 12-14 times in its first year of operation. The pipeline, touted as a guarantee of energy independence for the U.S., will actually raise oil prices in the Midwest, according to TransCanada's own internal documents. Keystone XL will raise Midwest oil prices up to 40 cents per gallon, according to Consumer Watchdog. Keystone XL isn't actually an oil pipeline; it is diluted bitumen ("dilbit"), an abrasive pipe-destroying goo which won't flow unless thinned with carcinogenic solvents whose exact composition TransCanada refuses to disclose to the landowners it has threatened with eminent domain condemnations. Also, the stuff must be pressurized up to 1600 PSI (conventional crude flows at 600 PSI) and heated up to 160 degrees. Because unusually toxic dilbit isn't technically oil, TransCanada (and Exxon, for that matter) refuse to kick in eight cents per barrel to the Treasury Department's Oil Spill Liability Trust Fund. The current route of Keystone XL crosses the northeast edge of the Ogallala aquifer, the largest, purest underground aquifer in North America, which, in Nebraska alone, is literally the wellspring of a $20 billion ag industry. Apologists have claimed that the pipeline will create lots of U.S. jobs. "The way that executive order is written," Sanders said. "It’s specific to new pipelines or those that are being repaired. Since this one is already currently under construction, the steel is already literally sitting there; it would be hard to go back." Deena Winter reported that 230 miles of the pipe had been sitting in a pasture in North Dakota for five years. That was in 2013! Boosters claim that the pipeline will create energy independence for the U.S.
That is nonsense; the pipeline is through the U.S., not to the U.S. The product will be refined in Houston and sold on the world oil market to the highest bidder.